Christmas time is that very special time of the year signifying happiness, caring and family togetherness. Preparation of the traditional cakes and sweets that are a part and parcel of Christmas starts a month in advance, filling the house and neighbourhood with enticing smells. For many people, one of their strongest childhood memories, is the enticing aroma of baking at Christmas. This is the time, when the whole house is in a festive mood, with the anticipation of Christmas, and everyone in the family chips in to help prepare those heavenly delights, such as the traditional Christmas Cakes, kalkals and Rose Cookies, many other sweets and goodies that are prepared specially for Christmas. Christmas cakes are the best place to start if you want to get in the Christmas spirit nice and early. Christmas cakes are delicious if you make them in advance and feed it your chosen liquor gradually over the weeks leading up to Christmas. Most Anglo-Indian families have their own recipe for the Christmas Cake, that is usually handed down through generations. Candied fruit, plums, currants, raisins, orange peel etc are dexterously cut and soaked in Rum or Brandy a few weeks in advance. Nuts are peeled and chopped and the whole family comes together to make the cake. Jobs are allotted to everyone - one to whip up the eggs, while another creams the butter and sugar, the flour is sieved, cake tins are lined, and a strong pair of arms are requisitioned to do the final mixing and stirring. 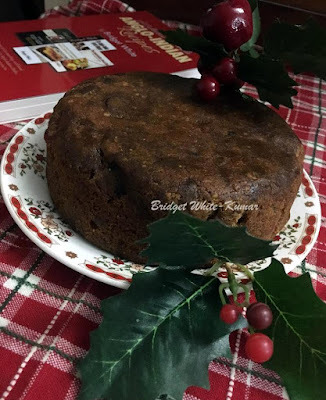 After the cake batter is poured into the tins, the real fun starts with everyone fighting to lick the leftover batter in the mixing bowl and from the spoons and spatulas -- Here is a recipe for Christmas Cake that I’ve been using for many years. It may not look very dark but its rich and tasty. Remove the chopped fruit from the rum, drain and keep aside. Sift the flour, baking powder, cinnamon powder, nutmeg powder and salt together. Dust the orange / lemon peel and the chopped soaked fruit with a little flour. Cream the butter and sugar well. Add the beaten eggs, treacle / date syrup, vanilla essence, orange / lemon zest and mix well. Now add the Black Currant Jam / Marmalade, orange / lemon peel and chopped fruit. Slowly add the flour and mix gently till all the ingredients are combined well. If the mixture is too thick add a little milk. Remove from the oven when done and set aside to cool. When the cake is completely cool, poke all over with tooth pick and drizzle brandy or rum all over the cake, (repeat once in every week or ten days). Wrap in foil paper, and store in an air tight container. This cake will last for months if stored in an air tight container. 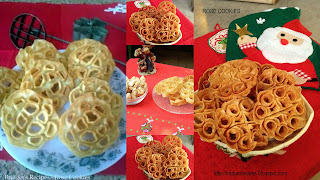 Rose Cookies are delicious fried Anglo-Indian Christmas Treats. Though named as Cookies, they are not cookies in the strict sense as they not baked but deep fried in hot oil. Rose Cookies are also known as Rosette Cookies, Rosa Cookies, etc and are prepared with a sweetened batter consisting of Flour, Eggs, Vanilla Extract and Coconut milk. Believed to be another culinary legacy left by the Portuguese in India, they are known as Rose de Coque or Rose de Cookies in Portugual. (They are also known as Rosettes in Sweden and Norway). The crisp cookies are made by plunging a special hand-held ‘Rose Cookie Mould’or ‘Rosette Iron’ lightly coated with a sweet batter into hot oil. The Rose Cookie Mould or Rosette Iron is a long handled gadget with intricately designed iron moulds of different flowers such as roses and daisies. The Mould or Iron is heated to a very high temperature in oil, dipped into the batter, then immediately re-immersed in the hot oil to create a crisp shell around the hot metal. The mould or iron is shaken slightly, till the Rose Cookie gets separated from it. The delicate golden brown, light and crispy cookie thus separated from the mould /iron floats to the top and is taken out from the hot oil with a flat porous spoon. Though a time consuming and laborious process, Rose Cookies are incredibly delicious. Mix all the ingredients together to form a smooth slightly thick batter. Heat oil in a deep pan till it reaches boiling point. Now place the rose cookie mould into the oil to get hot. When the mould is hot enough dip it half way only into the batter and put it back immediately into the boiling oil. Shake the mould gently to separate the cookie from it. Heat the mould again and repeat the process. Fry rose cookies till brown. Continue in this way till the batter is finished. This is one of the easiest chicken recipes with minimum ingredient and with almost no effort you get a tasty chicken dish in no time at all. 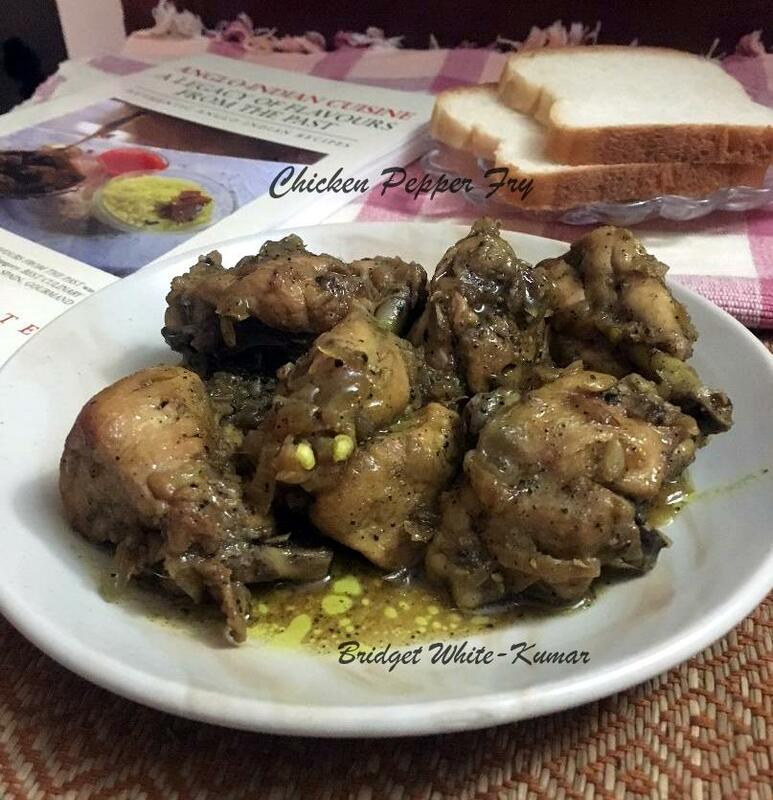 Garlic and Pepper combine to give this Chicken dish an out of the world taste. Heat oil in a pan and fry the onions and chopped garlic lightly. Add the chicken and mix in the pepper powder, turmeric powder and salt. Fry for a few minutes till the oil leaves the sides of the pan. Add ½ cup of water and cook on low heat till the chicken is tender and semi dry. You could add boiled potatoes towards the end and mix it with the chicken. Serve with Bread or as a side dish. This is a good starter for Parties as well. Crumble the cake into smooth crumbs without lumps. Remove from heat and cool for a little while. Add the cake crumbs, glaze cherries / nuts and Rum and mix well. Refrigerate for 20 minutes, stirring occasionally, or until just firm enough to handle. Take small portions of the mixture and roll into balls using the icing sugar to bind them. (use more icing sugar if required to make the balls firm). 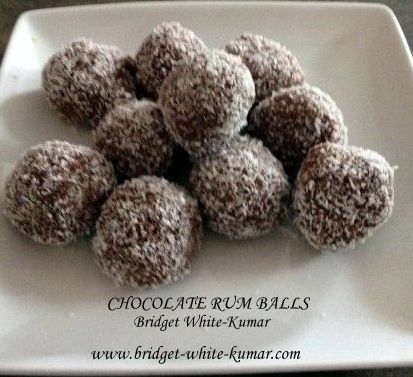 Now roll the balls in the cocoa powder to coat them well. Refrigerate till required to serve. 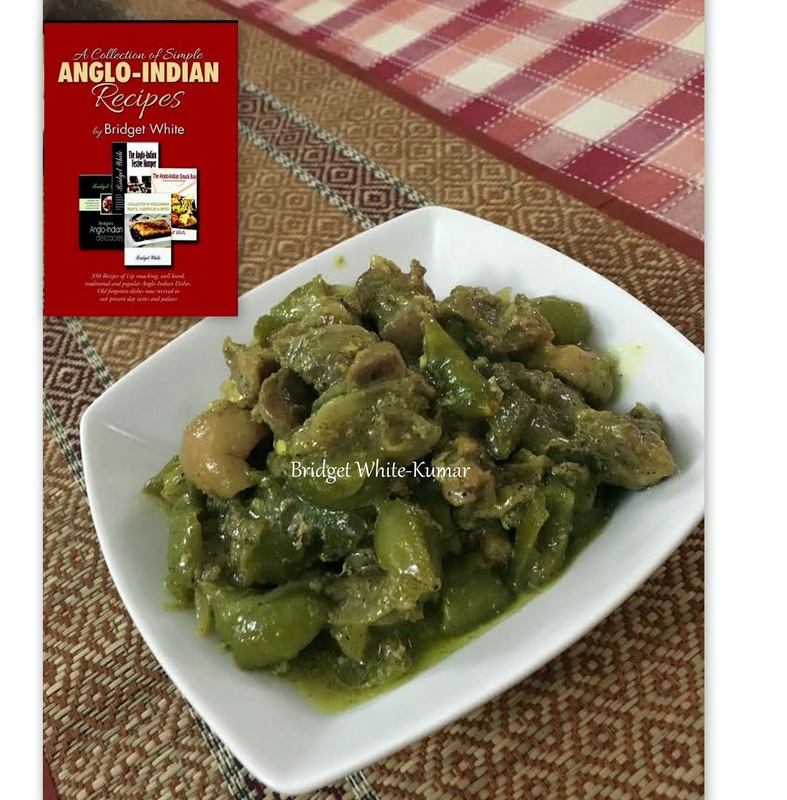 This is an old Anglo-Indian favourite. Made mostly at Christmas time and even at other times as well. 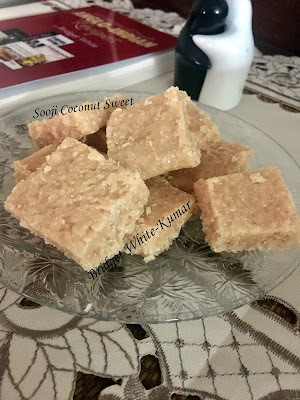 The roasted sooji (Semolina) gives a nice robust taste to the Coconut Sweet. Roast the semolina with one teaspoon ghee till it gives out a nice aroma. Remove from heat and keep aside. Add the semolina, essence, food colour and ghee and mix well. Simmer on low heat till the mixture becomes thick and leaves the sides of the vessel. Heat oil in a large pan and fry the onions till golden brown. Add the ginger garlic paste and the curry leaves and fry for some time. Now add the chillie powder, coriander powder, spice powder or garam masala powder, turmeric powder and coconut and fry for a few minutes till the oil separates from the mixture. Now add the tomato juice and salt and simmer for some time. Add sufficient water and bring to boil. Meanwhile get the meat balls ready. Mix the spice powder, salt, chopped green chilies, turmeric powder and coriander leaves with the mince and form into small balls. When the curry is boiling slowly drop in the mince balls carefully one by one. Simmer on slow heat for 20 minutes till the balls are cooked and the gravy is not too thick. Serve hot with Coconut Rice and Devil Chutney. 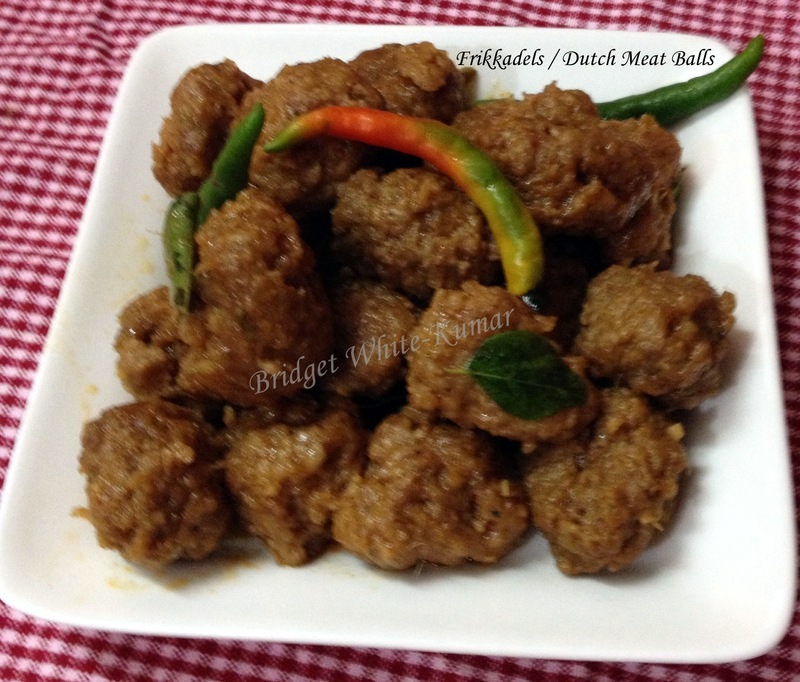 Frikkadels or Frikadellers are pan fried or braised meat balls (or patties ) made with spiced ground meat or meat mince of either beef, lamb or chicken. 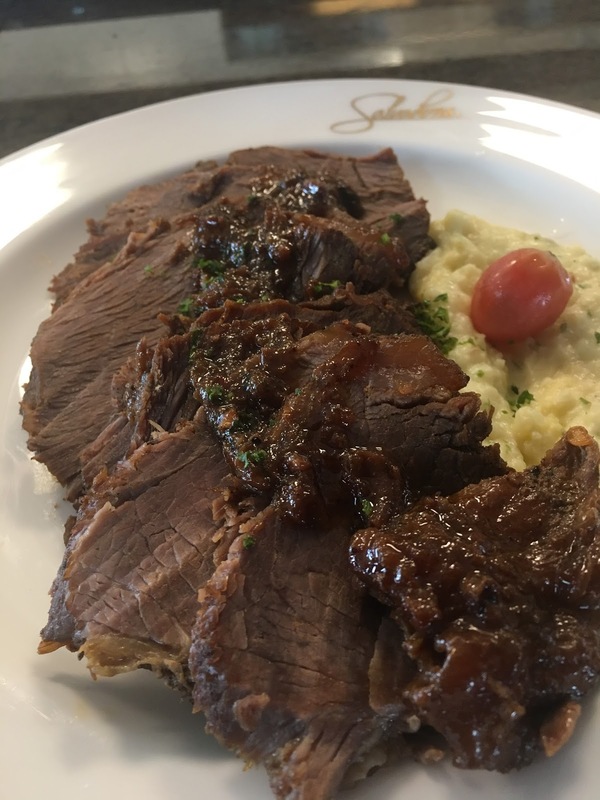 Serve on top of creamy garlic mashed potatoes. Wash the meat and rub it well with the vinegar, salt, chillie powder and pepper. Leave aside for 1 hour. Add the oil in a pressure cooker, and add the whole portion of meat. Sear the meat by turning the meat on all sides till it changes colour. Add the onions, potatoes and sufficient water and cook till the meat is tender. Open the cooker and continue to simmer on low heat till all the soup dries up and the meat is nicely brown all over and the potatoes too are nicely roasted. 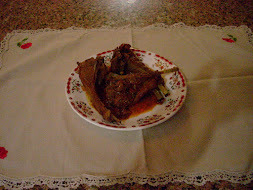 Note: The same recipe can be used for making Mutton or Lamb Roast as well. 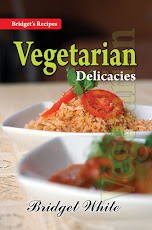 Vegetarian Delicacies is a collection of simple and easy recipes of delectable Vegetarian Dishes. The repertoire is rich and vast, ranging from simple Soups and Salads, to mouth watering Curries, Stir fries, Rice dishes, Casseroles and Baked Dishes and popular Accompaniments. The easy-to-follow directions, using easily available ingredients, make cooking these dishes simple, enjoyable and problem-free. The book also highlights the goodness of each vegetable and their nutritive and curative properties in preventing and curing many health disorders. 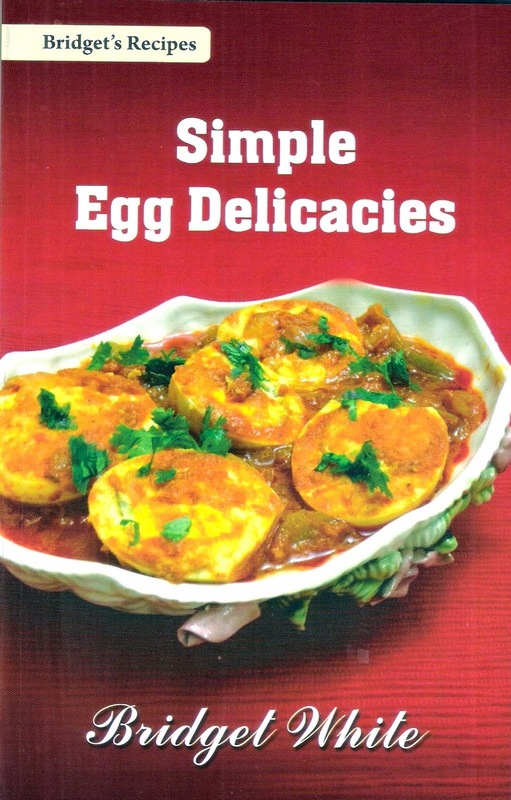 Simple Egg Delicacies is a collection of simple and easy recipes of delectable Egg Dishes for Breakfast, Lunch and Dinner and for all other times as well. 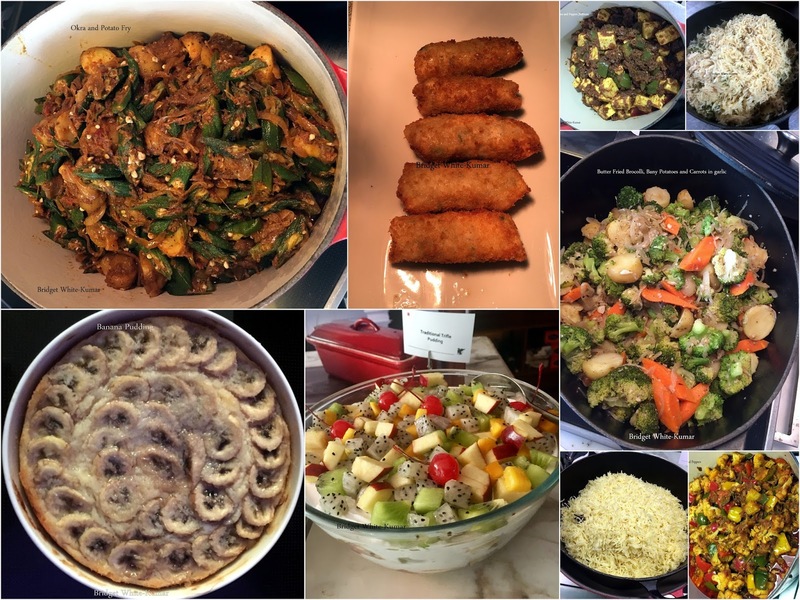 The repertoire ranges from simple Breakfast Egg Dishes and Egg Salads, to mouth watering Curries, Tea Time treats, Sandwiches, Casseroles and Baked Dishes. 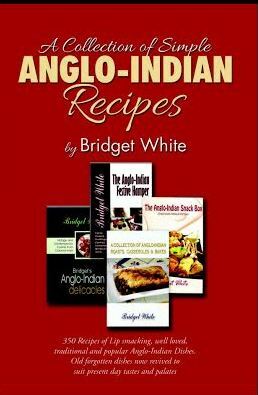 The recipes are extremely easy to follow and only easily available ingredients have been suggested. - A real treat for ‘Eggetarians’. Anglo-Indian Delicacies is an interesting assortment of easy- to- follow Recipes of popular vintage and contemporary Cuisine of Colonial Anglo India. It covers a wide spectrum, of recipes ranging from mouth watering Gravies and Curries, Mulligatawny and Pepper Water, Meat Fries, Roasts and Steaks to tasty Pulaos and Pickles, Savouries, Sweets and Christmas treats including a few home brewed wines to round off the extensive flavours and tastes. 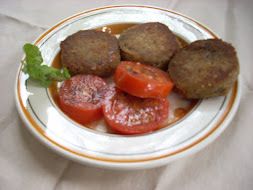 Some of the old typical dishes that were popular in Calcutta, and other parts of Bengal besides Central and Eastern India, such as Pork Bhooni, Chicken / Meat Jal Frezie, Devil Pork Curry, Calcutta Cutlets (Kobhiraji Cutlet), Fish Kedegeree, Double Onions Meat Curry (Do Piaza), Meat Glassey (Glazzie ) or Fruity meat Curry, Meat and Spinach Curry, Duck Dumpoke, etc, are some of the old favourites featured here. 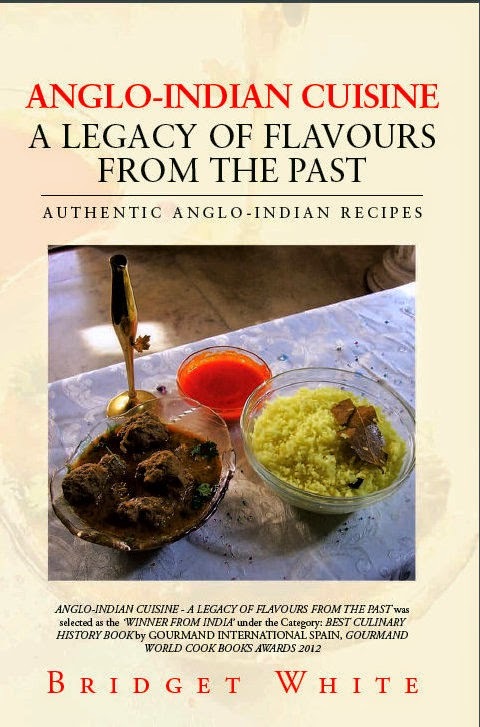 I’ve also included recipes for dishes that were popular during World War II and were served in the Army camps and Officer’s Mess, such as the Army Camp Soup, Brown Windsor Soup, The Bengal Lancers Shrimp Curry, Veal Country Captain (Cold Meat Curry), Bubble and Squeak, One Eyed Jack, Colonel Sandhurst’s Beef Curry, Salted Tongue, Salted Beef, Corned Beef, Kalkals, Rose Cookies, Dhol Dhol, BeefPanthras, Potato Chops etc. 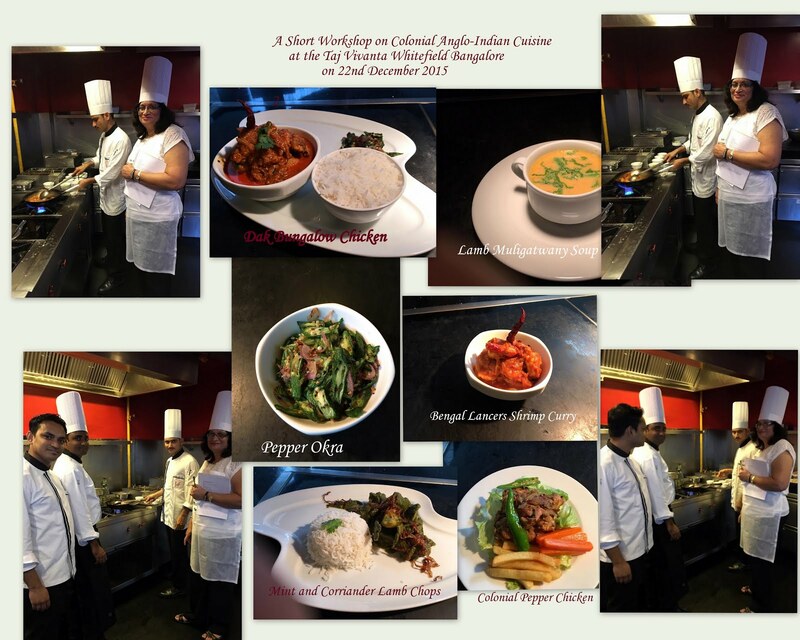 All these dishes have been given a new lease of life, besides a host of other assorted dishes and preparations. 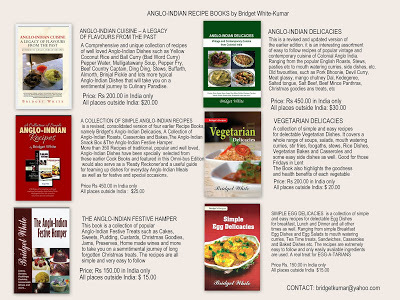 The Anglo-Indian Festive Hamper is a collection of popular Anglo-Indian festive treats, such as Cakes, Sweets, Christmas goodies, Puddings, Sandwiches, Preserves, Home-made Wines, etc, etc. The repertoire is rich and quite vast and takes you on a sentimental and nostalgic trip of old forgotten delicacies. 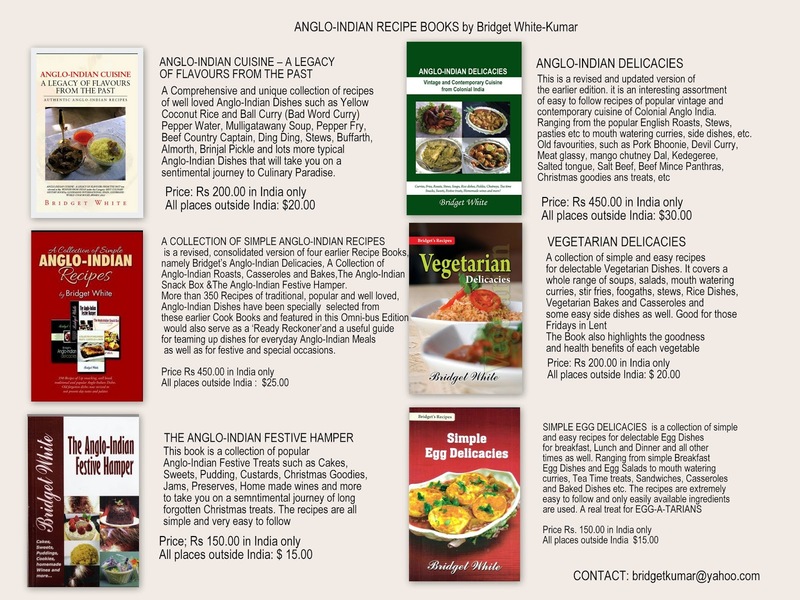 These mouth watering concoctions are a mix of both ‘European’ and ‘Indian’, thus making it a veritable “Anglo-Indian” Festive Hamper. The easy-to-follow directions make the preparation of these old, popular, mouth watering goodies, simple, enjoyable and problem-free. 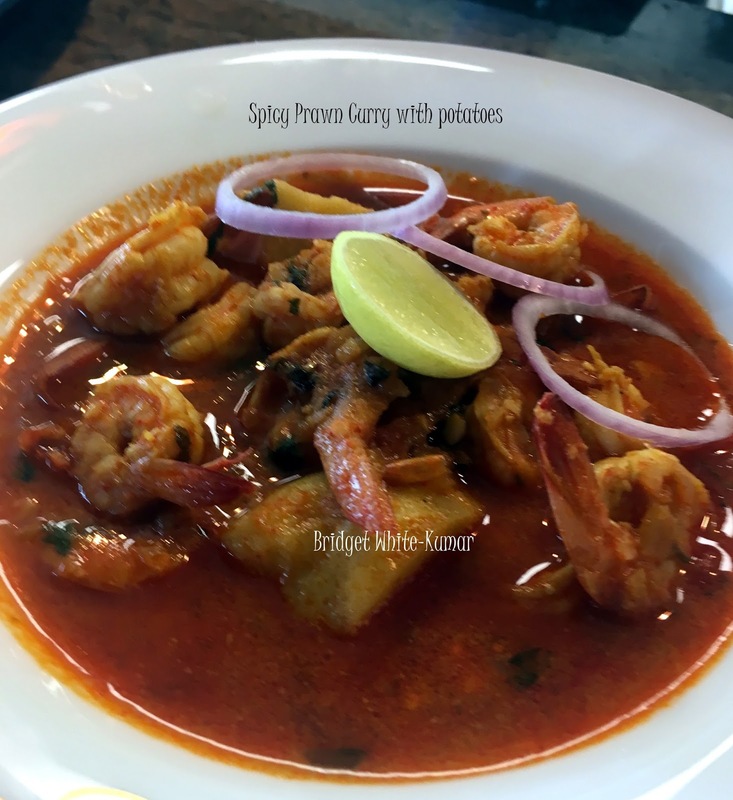 A simple and easy to cook Prawn Curry. It goes well with Rice, Bread, Chapatis or any Indian Bread. Mix the prawns with a pinch of turmeric and salt and keep aside. Heat the oil in a pan and sauté the onions for some time till translucent. Add the ginger garlic paste, chillie powder, coriander powder, cumin powder, turmeric powder, salt and tomato and fry till the mixture separates from the oil. Now add the prawns and mix well. Add a little water and the potatoes and mix well. Cover and cook on low heat for about 10 minutes till the gravy is very thick and the prawns are cooked. Garnish with a few chopped coriander leaves. This is a very simple Pudding that requires just 7 ingredients and could be done in just 10 minutes. Have it while its still warm or chill it in the fridge for later. Remove the crusts from the bread and apply the jam liberally on them. Cut each slice into quarters, then lay them in a flat glass dish. Boil the milk and condensed milk together. Mix the Custard Powder with some cold milk in a cup, then add it to the boiling milk. Add the vanilla essence. Simmer on low heat for a few minutes till the mixture starts thickening. Remove from heat and pour over the bread. Sprinkle chopped nuts or raisins on top. 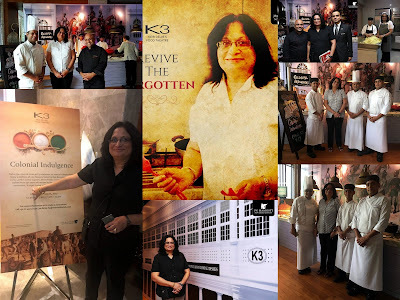 It's been an awesome and amazing experience being part of the Colonial Anglo-Indian Food Promotion Event #thememsahibskitchen at K3, J W Marriott Hotel New Delhi Aerocity. 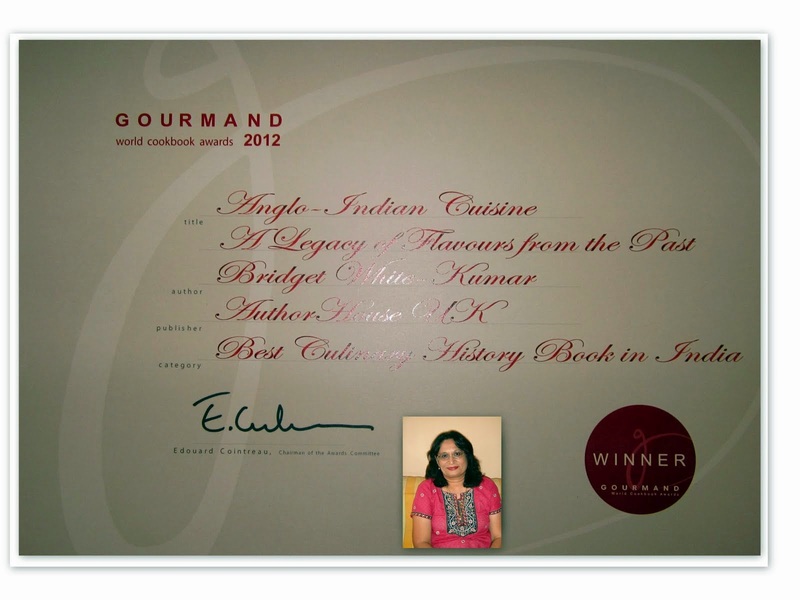 Thank you so much J W Marriott Hotel for giving me the privilege of recreating and bringing back to life old forgotten foods and simple dishes of yore that were innovated and invented by the khansamas and cooks in those early days of the Colonial period. 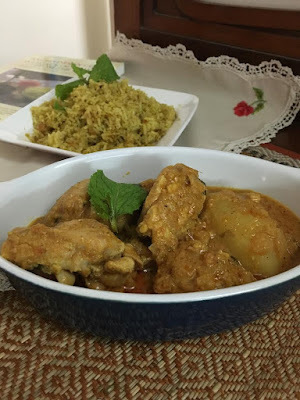 The rustic and robust flavours of dishes that were served by the cooks at the Dak Bungalows and Inspection Bungalows to the British Officers while on their official tours across the country such as the Dak Bungalow Chicken Curry and fry. The delicious Railway Lamb and Vegetable Curries that were first served on the Great Indian Peninsular Railway also known as The Blue Train that began its three day journey from Bombay’s Victoria Rail Terminus to Calcutta via Allahabad for the first time on 7th March 1870 covering a total distance of almost 4000 miles. Then the East India Company legacies of lamb chops, Bread and Butter pudding, Roly Poly Jam Pudding and steamed ginger pudding, besides other dishes associated with British colonial cooking such as Kedegeree (the anglicised version of kichidi, a rice dish cooked with pulses then mixed with quartered hard boiled eggs), Rissoles, Potato Chops and Pantras, Cutlets and Croquettes. 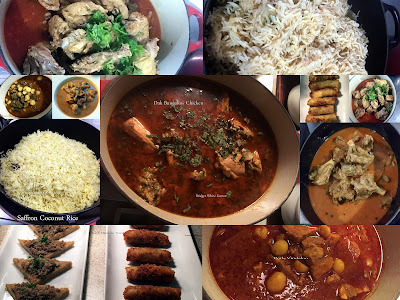 The Portuguese legacies of Vindaloo and Tangy Curries and Sweets, the Dutch Fish and lamb Mince Friccadels and not forgetting the other old dishes such as Grandma's Country Captain Chicken, lamb Mince Ball (Kofta) Curry, Saffron Coconut Rice, Anglo-Indian Tomato Pilaf, etc. Thank you J W Marriot Hotel New Delhi Aerocity, Executive Chef Vikram Bhatt, Executive Sous Chef Ishika, Mr Rohit Sharma and Mr Nikhil Nair for this wonderful opportunity. My special thanks to the wonderful team of Chef Kamal Sen, Hardik Narang, Akanksha Dean, Hitesh and others who were so eager to learn this new cuisine and recreate these old dishes for the festival. God bless you all. (A tangy slightly spicy dish. 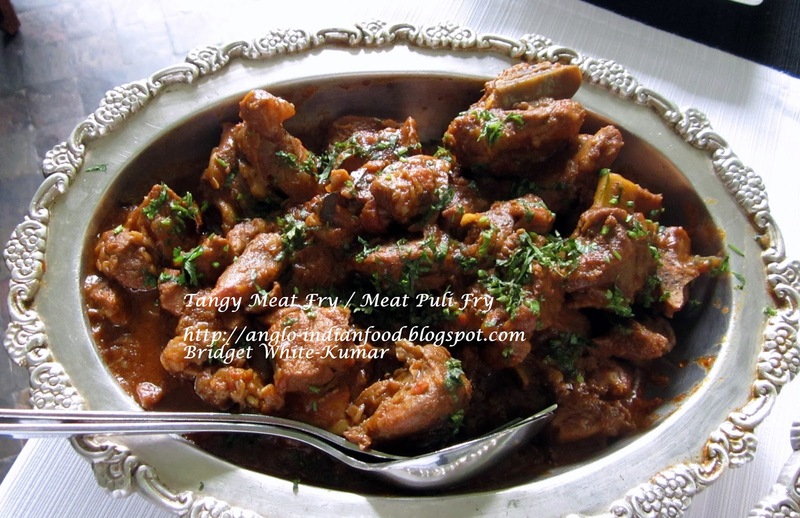 Tender pieces of Mutton cooked with selected spices in a tamarind sauce). 3 green chillies slit lengthwise. Make a paste with the ginger garlic paste, salt, coriander powder, cumin powder and the chillie powder with a little water. Heat oil in a pan and fry the onions till golden brown. Add the paste and the green chillies and fry well till the oil separates from the mixture. Add the boiled mutton and along with the left over soup and the thick tamarind juice and mix well. 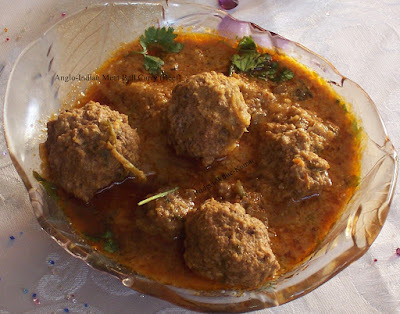 Cook on medium heat till the mutton is tender and the gravy is thick and dark brown. Garnish with slit green chillies. Let the curry stand for half an hour before serving to draw in all the flavours. 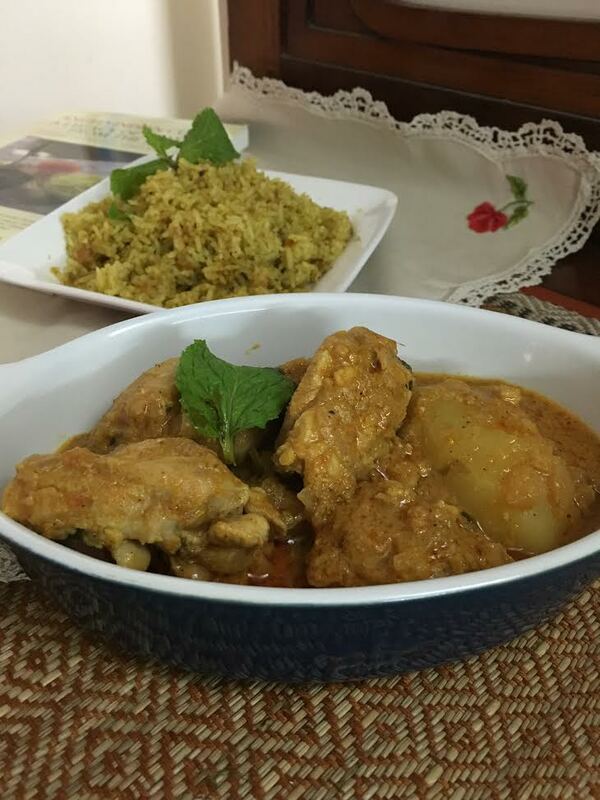 Serve with steamed rice or chappatis. This is an old Colonial Recipe that originated during the British Raj. It was served at all the Clubs and Army Messes in the middle 1900s. It goes well with any Rice such as Coriander Pilaf, Coconut Rice, Steamed White Rice, etc or with any Indian Bread or just Dinner Rolls. Heat oil in a pan and fry the onions cinnamon, cloves, cardamom, dry red chillie and pepper corns lightly. Add the chicken, mix in the garlic paste and sauté for about 5 minutes on medium heat. Add the chillie powder, turmeric powder, and salt. Mix well and stir fry for a few minutes. Add ½ cup of the chicken stock and cook till the chicken is tender and the gravy is quite thick. Ps. his recipe can be adapted to meat as well. Left over Beef or Lamb Roast can be made into a delicious County Captain Fry or a cold meat curry if desired. Here are a few recipes to make your own Homemade Curry Powders at home. 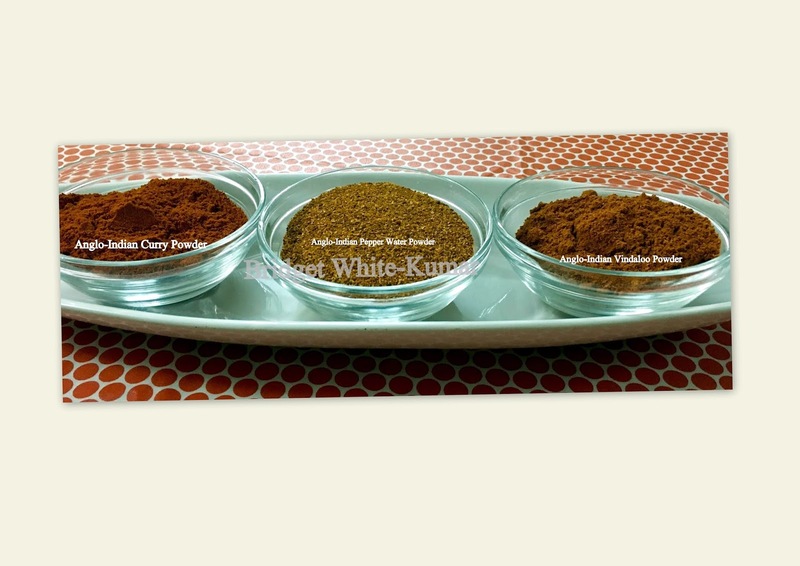 Homemade powders always give a better taste to curries than store bought curry powders. Make small quantities and store in air tight bottles or jars for future use. These Curry Powders will save you a lot of time while cooking and your Curry, Pepper Water and Vindaloo will taste so different. Roast the two types of chilies in a pan or in a microwave oven for a few minutes. Powder them at home in the dry blender or get it done at the mill. A teaspoon or two of this chillie powder could be used for any type of dish that calls for chillie powder. It can be stored for more than a year. Roast all the above ingredients separately then mix altogether and grind to a fine powder either in a blender or mixer at home or get it ground in a mill. A teaspoon or two of this powder can be used for almost all curries both vegetarian and non- vegetarian. It can be stored and used for more than a year. Roast all the above ingredients and then grind together to a powder. 2 teaspoons of this powder should be added to 2 cups of water, juice of 2 tomatoes, a lump of tamarind and a little salt and cooked for 5 minutes to make instant pepper water. This pepper water should be seasoned with mustard, garlic and curry leaves. Roast all the above ingredients together for a few minutes then powder in a mill or dry grind in a blender. Use 2 teaspoons of this powder for every ½ kg of meat when cooking Vindaloo along with the other ingredients as per the recipe. If this powder is stored in an airtight bottle it will stay fresh for more than a year. The same mixture can also be made into a paste if ground in vinegar but it should be stored in the fridge. Rumble-Tumble is another name given for Eggs that are scrambled. Heat oil in a pan and fry the onions ginger and garlic till golden brown. Add the slit green chillies and sliced capsicum and sauté for a few minutes. Add the boiled pork and a little more salt if necessary and simmer till semi dry. 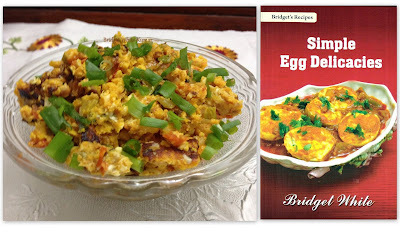 Serve with rice or bread or as a starter at a party.